NFL Commissioner Roger Goodell makes an announcement during the first round of the 2013 NFL Draft Thursday night. 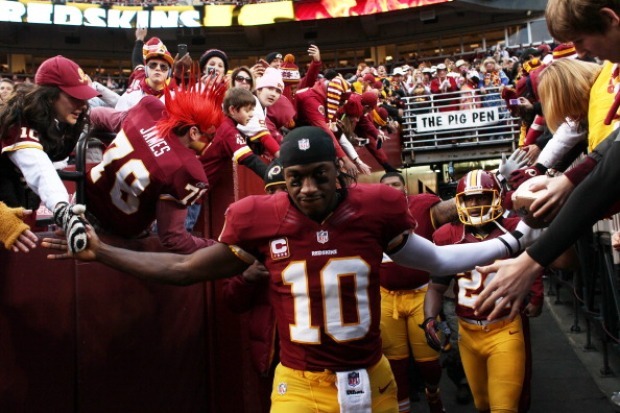 Robert Griffin III did a few jumping jacks, jogged in place and bounced up and down on the stage. The fans cheered. And chanted his name. And cheered some more. For many of the thousands gathered at the stadium, nothing the Washington Redskins did during the three days of the NFL draft meant more than the brief appearance by the franchise player on Saturday. The Redskins made some intriguing choices. They cornered the market on ball hawks and Florida State players who've been through career-threatening injuries, then took a chance with Bacarri Rambo, who failed two drug tests in college. But how much it matters will likely hinge on how quickly Griffin recovers from his surgically reconstructed right knee. 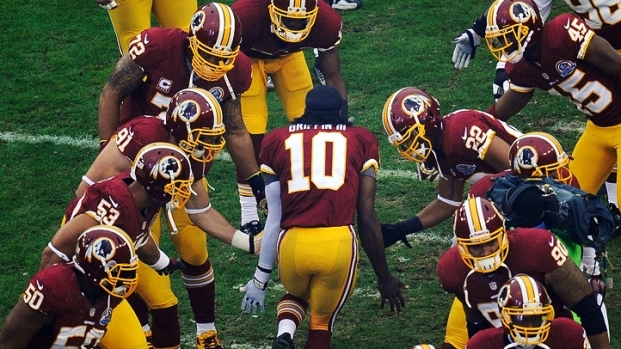 Meanwhile, back at Redskins Park, coach Mike Shanahan and the front office continued to add to a team than won the NFC East last season and hopes to become a Super Bowl contender with Griffin under center. The primary task to improve was the secondary, and the Redskins landed a unique haul. They selected the last two players to lead major college football in interceptions, along with the player who finished second in picks two years ago. Cornerback David Amerson grabbed 13 with North Carolina State to lead all FBS players in 2011; he was taken in the third round on Friday night. Safety Phillip Thomas had eight last year with Fresno State; he was chosen in the fourth round on Saturday. Rambo, a safety from Georgia, was runner-up to Amerson with eight in 2011; he went in the sixth round on Saturday. All are now members of a defense that allowed 4,511 yards passing last year, third worst in the NFL. Shanahan said this was a fortuitous draft in which the team's needs more or less aligned with the top players available when the Redskins were on the clock, even if meant taking a chance on a player who has been hurt or suspended. Thomas had an anxious wait before getting the call at No. 119 overall, even though he was a consensus first-team All-American. "I feel like I'm going to be the steal of the draft,'' he said. Thomas sat out the 2011 season with a broken left leg and dislocated ankle, but he returned last year to anchor a Bulldogs secondary that transitioned to a more aggressive 3-4 scheme. He grew up in California and went to college there, so his favoritism for the Redskins is pretty random. Rambo fell even farther than Thomas, going at No. 191 _ well below the projected slot for the 6-foot, 211-pound defensive back. Rambo failed drug tests was in 2011 and 2012, missing the season opener two years ago and the first four games last year. His high school coach said both failed tests resulted from inadvertent brushes with marijuana, adding that Rambo unknowingly ate marijuana-laced brownies last year. Still, he paid the price by falling to the back end of the draft. "I thought everybody had forgot about me, man. ... It was very hard because I felt like a lot of those guys wasn't near the guy I was,'' he said. By the time the sixth round came around, the Redskins felt he was a risk worth taking. Between the two safeties, the Redskins used the fifth round to pluck a pair of Seminoles who've had to make comebacks. Running back Chris Thompson was chosen at No. 154. He broke two vertebrae during the 2011 season and tore the ACL in his left knee last year. He's still rehabbing the knee, but he says doctors tell him he should be ready in time for training camp. Next came Brandon Jenkins of Florida State at No. 162, the pick the Redskins acquired in the trade that sent Albert Haynesworth to the New England Patriots in 2011. Jenkins played defensive end at Florida State, but he's expected to be an outside linebacker in the Redskins' 3-4 scheme. Jenkins broke his foot in last year's opener - a nasty injury to the Lisfranc joint - and was done for the season. He no doubt would have been one of the top pass-rushers available in the draft without the injury. But at least he's headed to the NFL. The Redskins' draft haul also included tight end Jordan Reed of Florida in the third round on Friday and their final selection, Rutgers running back Jawan Jamison in the seventh round. If they all pan out, Griffin will be able to do some more trash-talking to the fans on draft day next year.